As you might have guessed, Facebook, the world’s largest social network, is also the biggest in the U.S. when it comes to reading news. 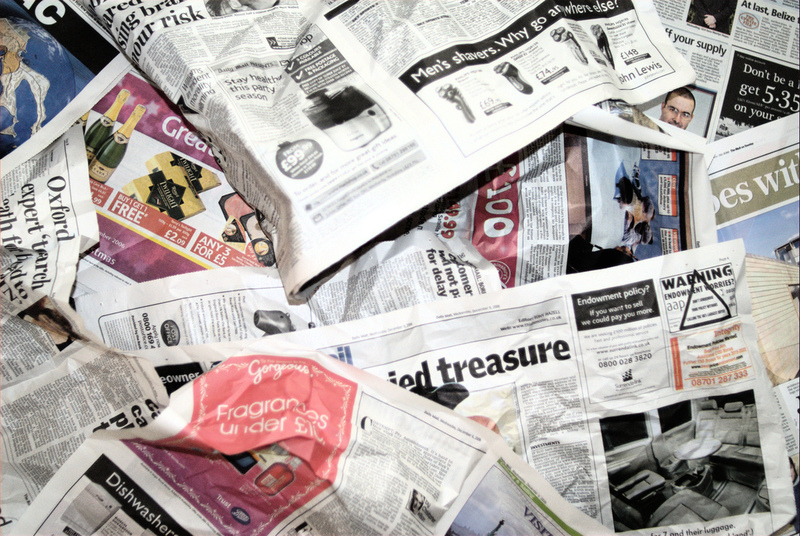 With 64% of U.S. adults using the site every month, roughly half of them (30%) are using it to read news. Interestingly, although Reddit is a far more niche social site, with only 3% of the U.S. regularly tuning in to upvote, downvote and ask me anything. 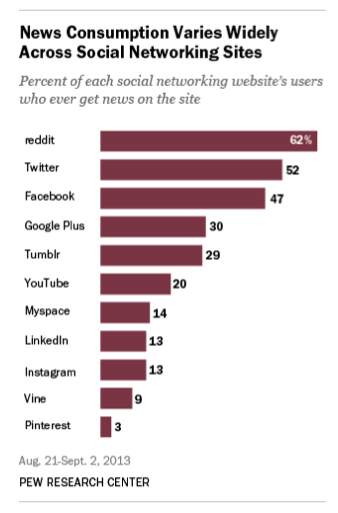 But when it comes to using it as a conduit for news, it’s the winner, with some 2% of U.S. adults using it for news — or 62% of its monthly users. Twitter comes in at second, with 16% of U.S. adults using it regularly, but just about half of those (52%, working out to 8% of U.S. adults) turning to Twitter for news. Although YouTube is second to Facebook in terms of overall usage in the U.S. — Pew says that 51% of all U.S. adults are using YouTube these days — it’s very low on the news stakes at the moment, touching only about 20% of its user base, or 10% of all U.S. adults. LinkedIn, meanwhile, is performing fairly poorly in terms of critical mass: only 13% of its users are turning to the site as a news source, working out to only 3% of all U.S. adults. Even MySpace (yes! 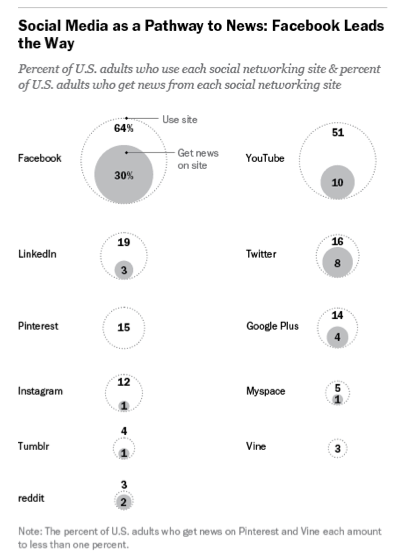 MySpace) has a higher proportion of its users turning to it for news. You can see why LinkedIn is working so hard to turn around its positioning as a go-to site for information. This is what partly motivated the company’s acquisition of Pulse, which just yesterday got integrated LinkedIn. This is one to watch to see if moves like this make a difference. On the other hand, as you can see from the demographic profile, it’s also the one with the most affluent news consumers. Demographics. While LinkedIn may attract the most affluent consumers, Twitter wins in the coveted 18-29 year-old bracket, with 45% of U.S. adults in that age group using Twitter to read news. In fact, it wins in the under-50 category overall, with some 83% of U.S. adults in that age category turning to Twitter for news consumption. Facebook is 10 percentage points behind at 73%. Twitter, as it happens, appears to be the one with the most equal gender breakdown, too, at a level 50/50 split between males and females. Facebook swings widely to women at 58%, while YouTube and LinkedIn seem to be more favored by men. 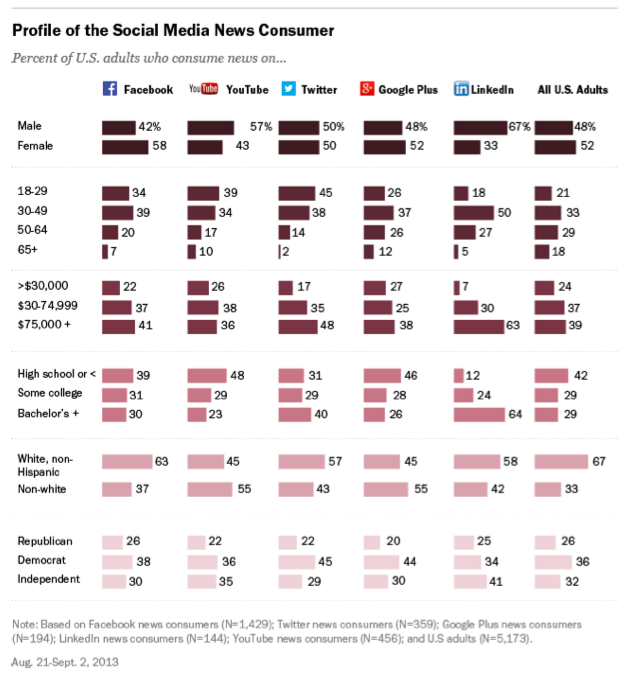 The sheer size of Facebook gives women overall a 52% share of U.S. adults who consume news via social sites.